The Ferrari Daytona, officially designated the Ferrari 365 GTB/4, is a two-seat grand tourer produced by Ferrari from 1968 to 1973. It was introduced at the Paris Auto Salon in 1968 to replace the 275 GTB/4, and featured the 275's Colombo V12 bored out to 4.4 L (4,390.35 cc, 267.9 cid). Unlike Lamborghini's then-new, mid-engined Miura, the Daytona was a traditional front-engined, rear-drive car. The engine, known as the Tipo 251 and developed from the earlier Colombo V12 used in the 275 GTB/4, was a 4.4 L (4,390.35 cc, 267.9 cid) DOHC V12 with a 60° bank angle, 365 cc per cylinder, 81 mm (3.2 in) bore and 71 mm (2.8 in) stroke, featuring six Weber twin carburettors (40 mm Solex twin carburettors were used alternatively). At a compression ratio of 9.3:1, it produced 357 PS (263 kW; 352 hp) and could reach 280 km/h (174 mph). 0-60 mph (97 km/h) acceleration was just 5.4 seconds. For the American version, slight modifications were made - the compression ratio was reduced to 8.8:1 and the exhaust system was equipped with a large central silencer, necessitating visible alterations to the primary pipes. Although a Pininfarina design, as with many previous Ferrari road cars styled by Leonardo Fioravanti, the 365 GTB/4 was radically different. Its sharp-edged styling resembled a Lamborghini more than a traditional Pininfarina Ferrari. Yet another French 1/43 multimedia car kit. This time, it is by Record. 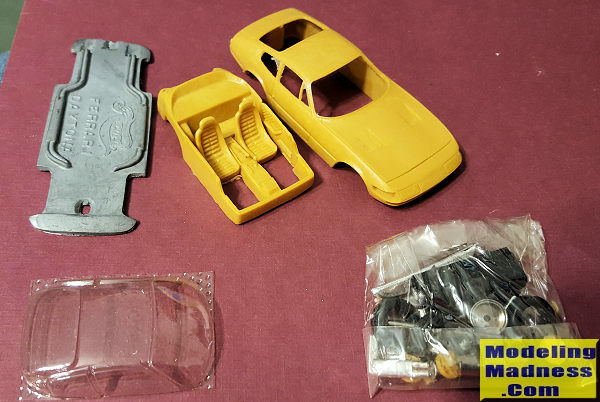 As you can see, the major parts of the car, interior and body are in resin. The molding is excellent with no visible flaws. There are, on the underside of these pieces, some pretty hefty pour stubs and there is some flash, but overall, they are very well done. Interestingly, this one has a metal chassis pan with the exhaust molded into it. The bag contains all the various smaller bits and since the cellophane is still in good shape, I have left it closed in order to not lose any smaller bit. The chrome pieces are in there as is the steering wheel, axles, aluminum wheels, wheel inserts, tires, mirrors and other smaller bits. There is a single clear vacuformed piece for the windows. Also in the bag I seem to recall seeing some p.e. windscreen wipers. These are two pieces each and look like a bit of a pain to install. There are no instructions. As I mentioned earlier, I bought four of these kits and none come with assembly instructions. No painting guide or photo either, but thankfully, Ferraris are well represented on the Internet and a lot of images are there for guidance. The truth is that may of the kits available are available as die-casts and often at a lower price than what you pay for the kit. 1/43 is really a major scale when it comes to die-casts. However, most reading this will be modelers and not collectors of die-casts. This is a particularly nice kit and thanks to its minimalist design and low parts count, would be a very nice one to get someone started into doing multi-media kits.